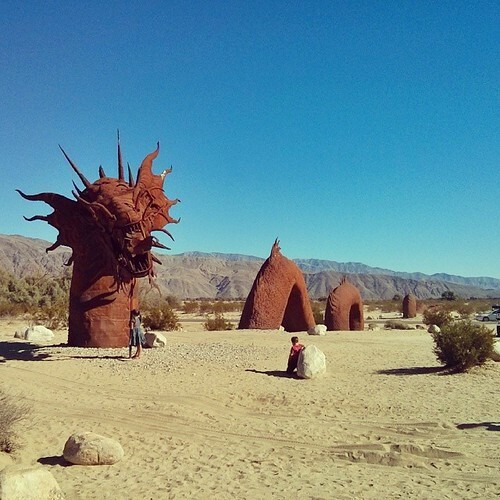 Mali Mish – Anza Borrego and Coachella Valley. 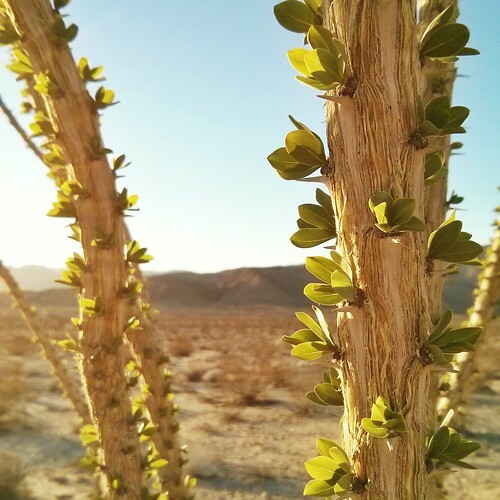 Anza Borrego and Coachella Valley. 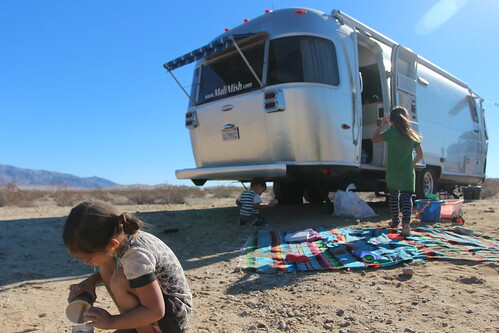 After holidays with family and a birthday party for Ava, we headed back out for the winter in the southwest. 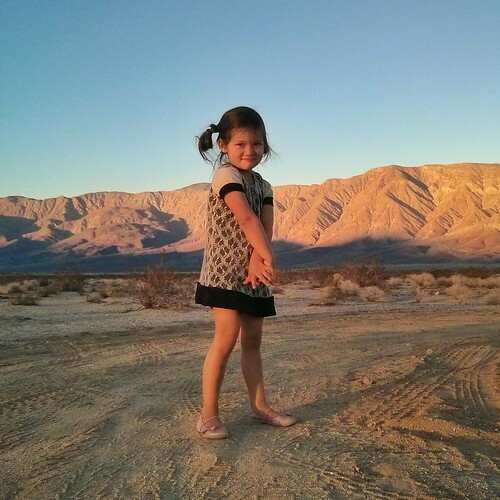 Our first stop is a place we haven’t been to since Mila was just an infant: Anza Borrego. 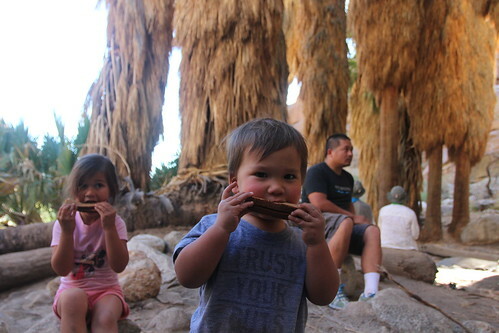 We drove down into Coachella Valley and stayed the first night at the Red Earth Casino. 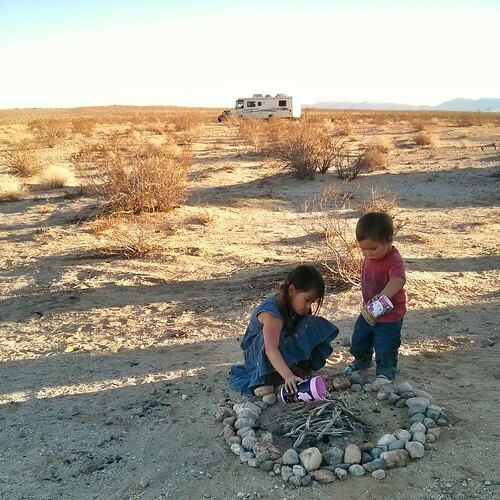 It is a little Indian Casino but a great place for an overnight. 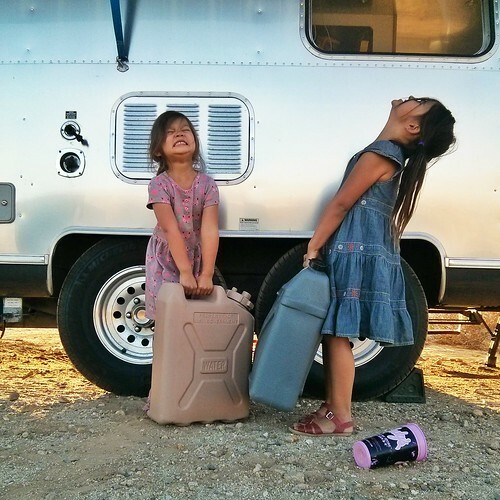 Gas is cheap and they have a free dump station and water fill station. 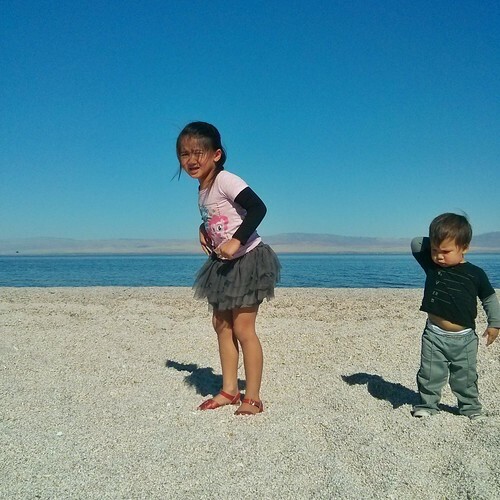 The next morning before we took the turn west to Anza Borrego, we decided to go check out Salton Sea Beach. 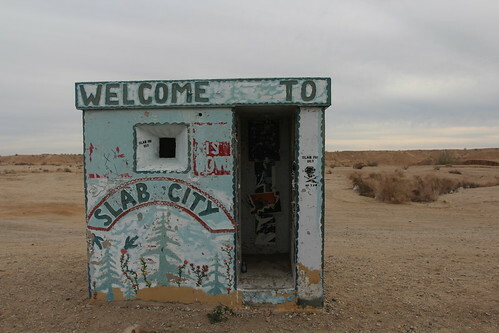 We have never been to the edge of the Salton Sea and this was our first time. 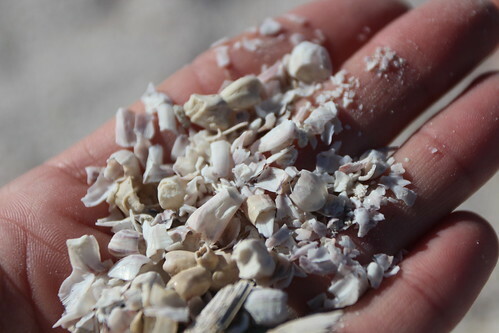 Sure it just looks like a white sand beach but if you look closely you will see that it is definitely not sand. Most of what you are stepping on is sharp pieces of fish bones. 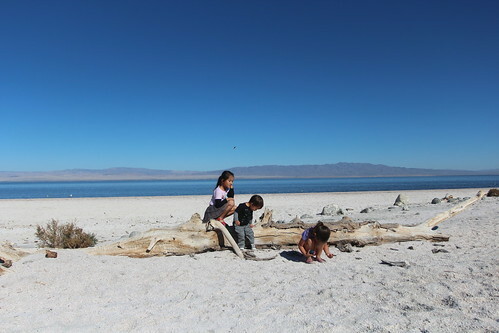 The salinity at the Salton Sea has been steadily increasing year after year because there are no outlets except for evaporation. 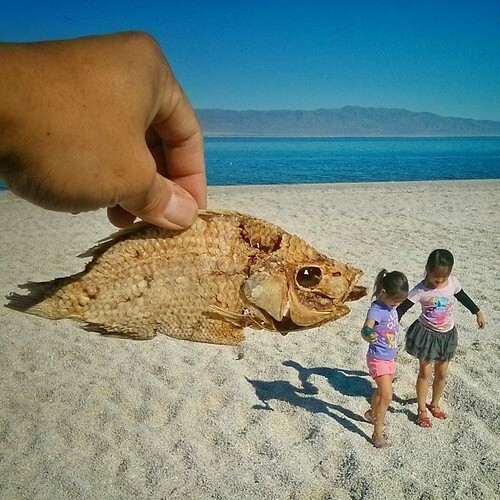 As the water gets saltier, less species of fish are able to survive. Ava did not like it when she found out what she was actually stepping on. 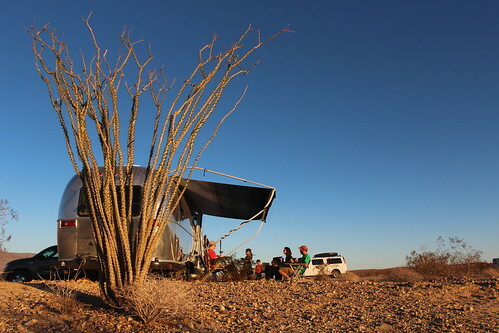 By the end of the day we finally made it to Anza Borrego. 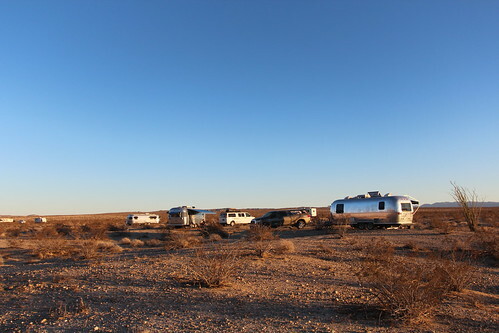 There had been several other Airstreamers here in the week before we showed up but most have left. 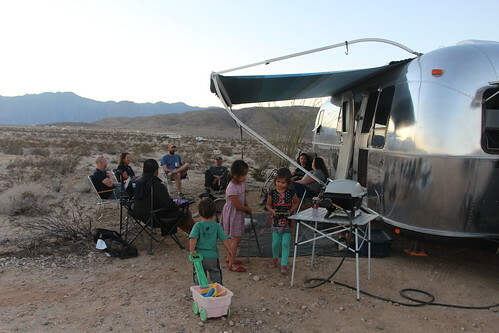 We did get to meet up with our friends Aluminarium and Watsons Wander who will be staying for a few more days. The kids are pretty excited to have Curtis around to play with. Every afternoon at 5 pm, Leigh comes around to remind us to get off of the computer and join them for happy hour. I must say it is not hard to comply. 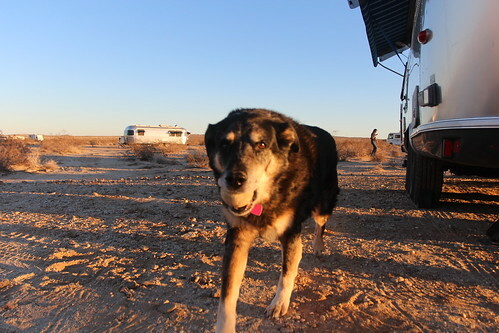 We also met a nice family that owns a tavern in Alaska and spends the summer traveling the 48 states in a 5th wheel. They have a couple of daughters but a good bit older than ours. 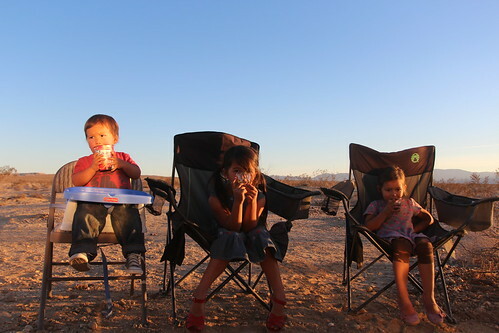 The kids are pretty content just filling up desert sand from one cup to the other. I wish my life was still that simple. 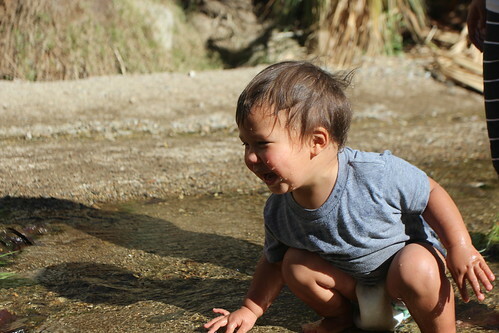 Luka and his doodoos. He is definitely a boy. 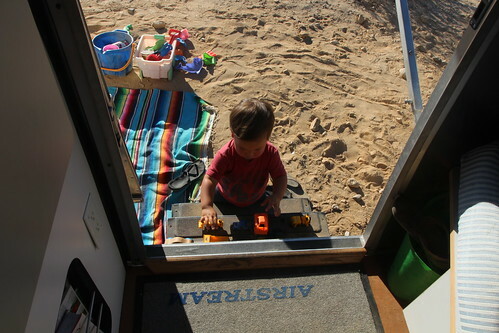 Unlike the girls who are totally into dolls and dressing up, Luka just wants dump trucks and fire engines. 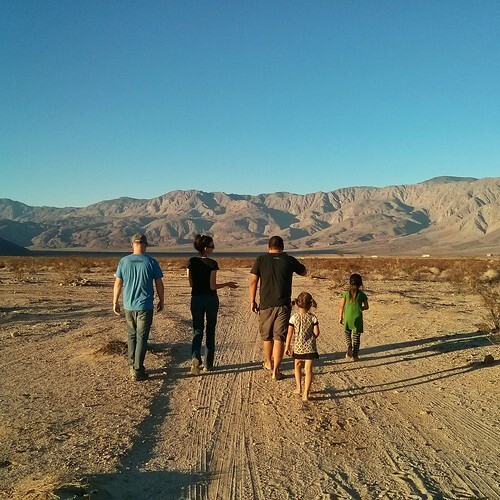 Besides happy hours, Brian and Leigh also get us off of our butts and go for walks with them. They track their exercises with a fitbit and must log in their required number steps every day. I guess this helps to balance out the extra calories from our happy hours. Mila is getting a lot better at walking and hiking without complaining. She looks so grown up in this picture. The Alaskans had a bonfire one night and we all went over and joined them. 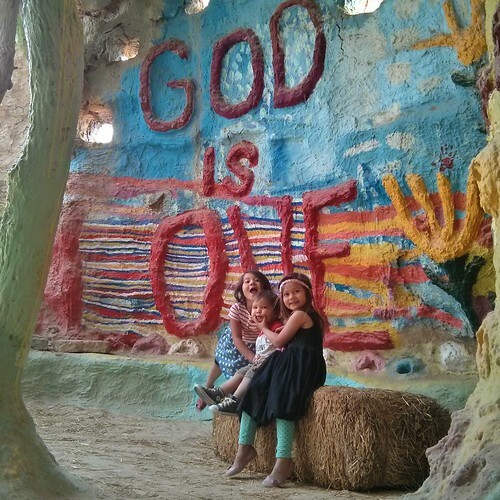 They’ve been homeschooling their girls for many years and are very nice and well behaved kids. 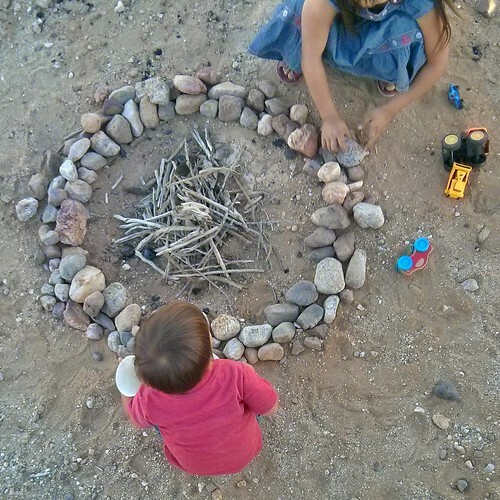 Every time we have a fire, the girls and Luka get inspired to build a little fire of their own. I think they are going to need my help to put it out if it gets out of control. 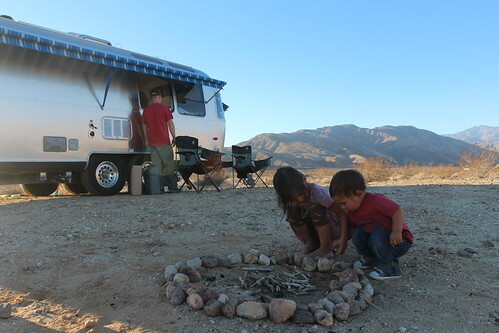 Life in the desert during winter is pretty awesome. The last day at Anza Borrego we headed into Borrego Springs. 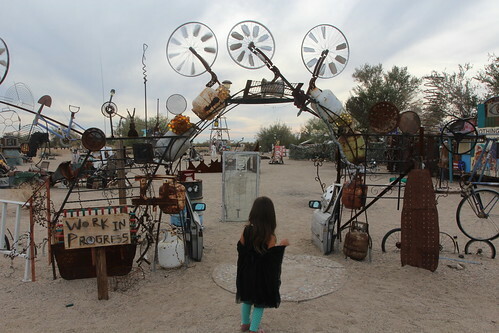 We had seen some of these metal sculptures at Galleta Meadows before but wanted to find some more of them. This dragon is probably the coolest of them all. If you have never seen these, its a series commissioned by stationary tycoon Dennis Avery. He is the Avery behind all of those sticky back labels I am sure you have used a time or two. 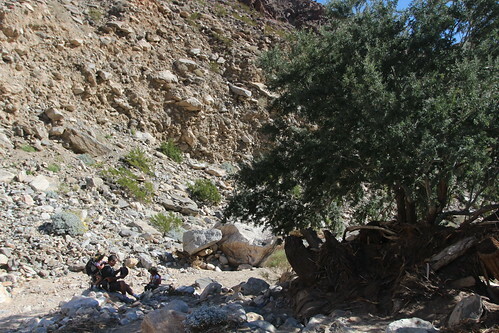 To complete our visit here at Anza Borrego, we decided to take a hike to Palm Canyon Oasis. It was a pretty tough one for the kids but they powered through it like champs. The reward at the end of the trail was totally worth it. 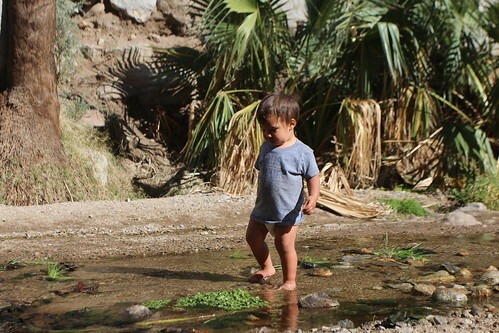 A real life desert oasis. 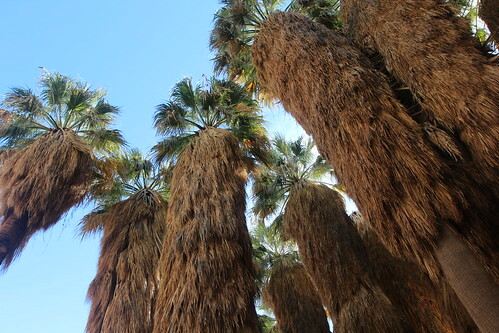 We brought and ate our lunch under the shaded canopies of these palm trees that feed directly from the underground spring. This has been a pretty dry year but there is still a decent amount of ice cold water pouring out. This is all they need to keep themselves occupied for hours. 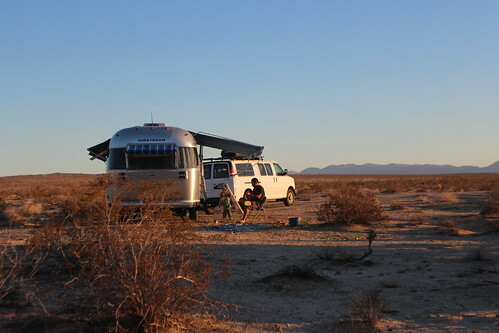 After a long day, we got back to the Mish to hitch up and head out of Anza Borrego just before dark. 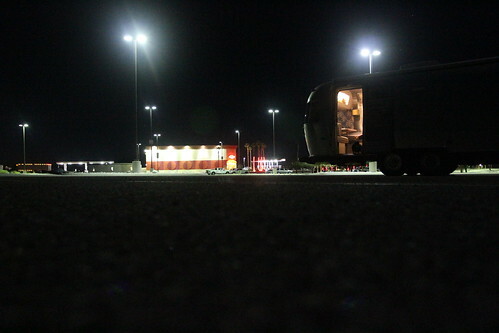 We spent another night at Red Earth Casino to dump and fill up our tanks. 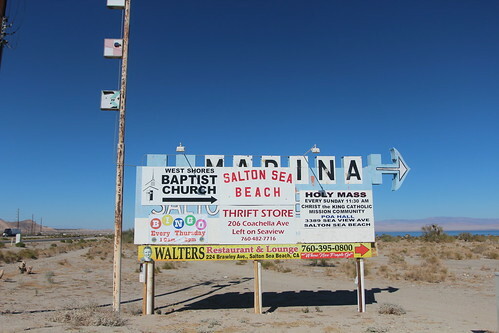 The next morning, we decided to take the long way around Salton Sea so we can do some more sightseeing. 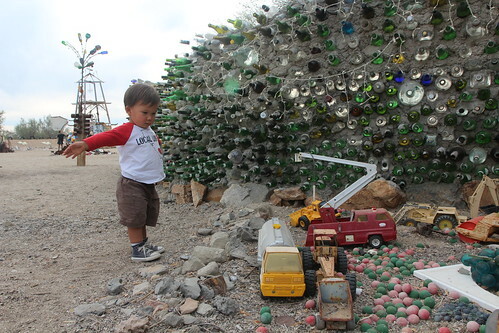 Of course we had to stop at Slab City. 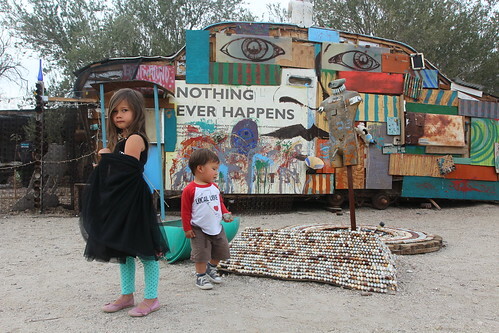 We actually wanted to check out East Jesus at the other side of Slab City. 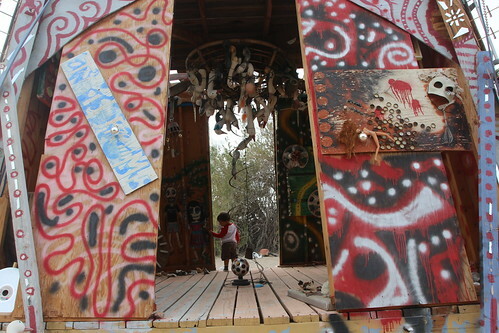 East Jesus is an ongoing community art project. 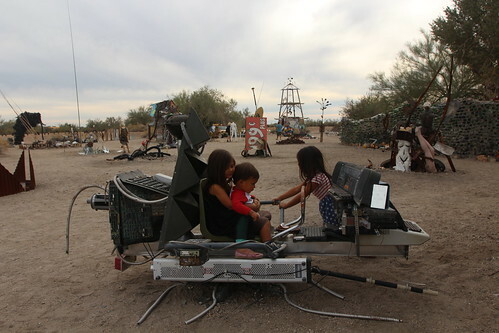 Artist come from all over the world to contribute. As a matter of fact, everyone is encouraged to add their two cents to this project. I am sure this “time machine” is full of rusty nails but what is the point of living if you don’t take a couple of chances? 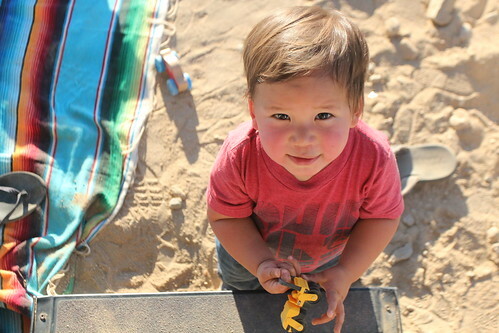 Yeah, this is Luka’s favorite part – Trucks and fire engines. 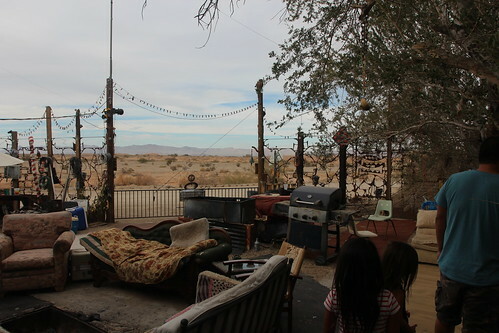 This is part of the living area behind the velvet ropes at East Jesus. 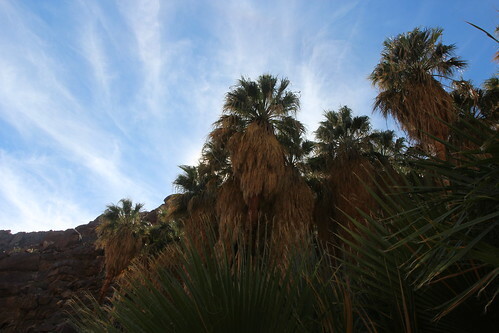 It can get scorching hot here in the summer and many of the residents are here year round. I know. It must be unbearable here when it hits 120 degrees. 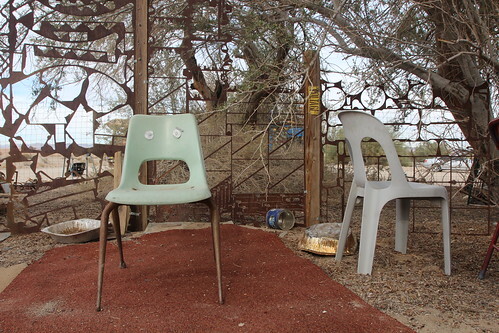 This chair certainly thinks so. 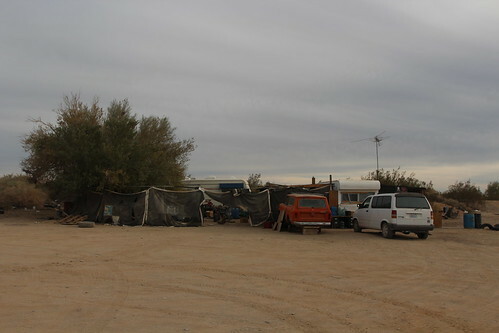 As we were driving out of East Jesus, these guys at this camp waved and yelled at us to come join their party. This guy on the other hand had no trespassing signs spray painted all over the walls. 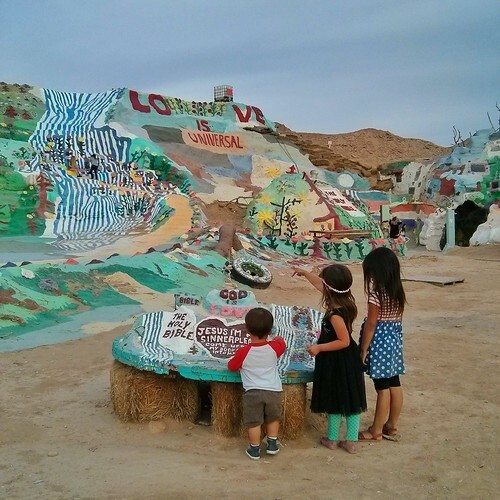 Before leaving the Slabs, we stopped again at Salvation Mountain. 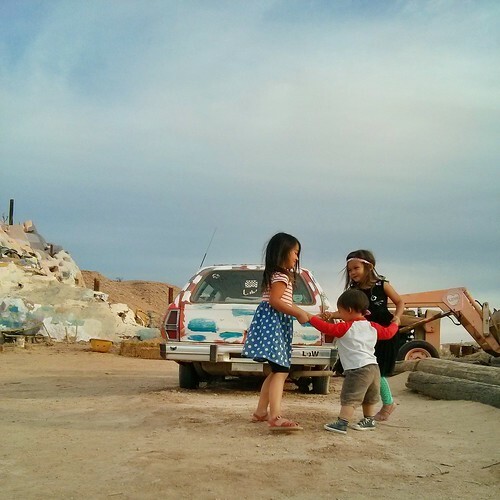 While we were here, we ran into an Instagrammer in the parking lot. 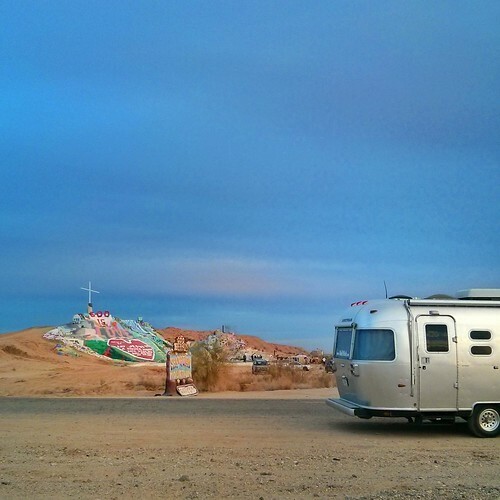 @i_am_chris_new lives in Los Angeles and travels on the weekends with his pup and takes fantastic photos along the way. He recognized the kids and came up to introduce himself. This is what I love so much about the social networks we belong to. We have met so many great people through them. A lot of people think that online social networks are keeping people away from real social interaction but it is quite the opposite for us. We have turned so many virtual friendships into real ones that I cannot imagine our lives without it. Thanks Leonard for building your monument. We will cherish it forever. Doheney State Beach in Dana Point, California. 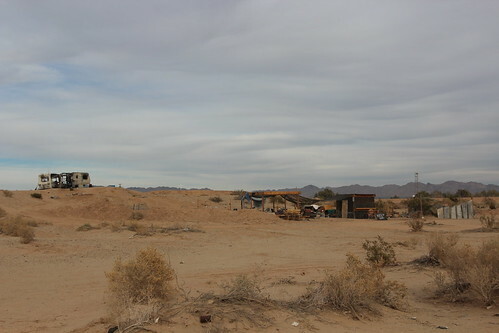 Yuma, Arizona and Casa Grande Ruins National Monument. 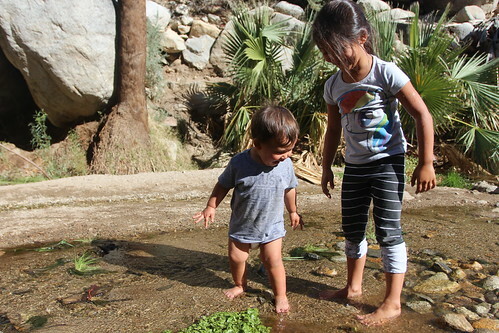 2 Responses to Anza Borrego and Coachella Valley. 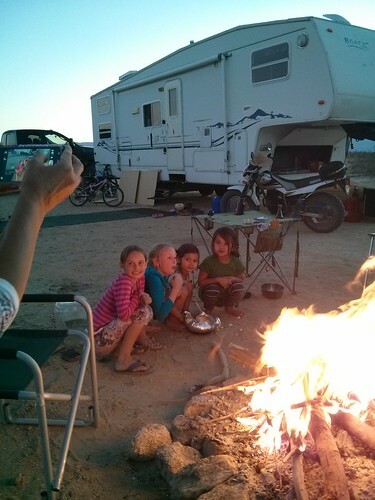 Life in the desert IS awesome! I miss our happy hours together. Me too!!! Luka misses Barba mouth! Haha.